Nothing adds more excitement to a golf tournament than a fabulous hole in one contest. Foresite Sports is a leading provider of hole in one insurance that allows you, the tournament organizer, the opportunity to offer spectacular hole in one contest prizes without the risk associated with running the contest. Our contest prize packages provide for multiple holes in one, so every golfer who makes an ace at your designated contest hole wins the grand prize. Don't delay, call us today to learn more about our popular hole in one insurance options. "A" Rated Prize Protection - We are Backed by the Most Financially-Secure Underwriters! Bonus Prizes - We Cover Every Par 3 Hole With Hole In One Prizes! 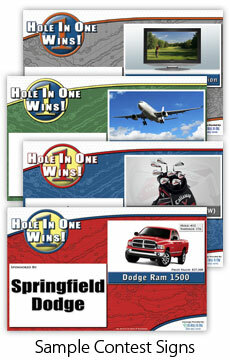 FREE Contest Signs - Full-Color, 35" x 22" Contest Signs for Each Hole In One Contest! FREE Rider Coverage - Multiple Holes In One are Covered! FREE Golf Club - Each Golfer In You Tournament Receives a Certificate Redeemable for a New Club! FREE Shipping - Contest Signage is Shipped via FedEx to Golf Course or Client! 110% Low-Price Guarantee - We'll Meet & Beat Lower Prices from Any Legitimate Competitor! All pricing is based on three distinct factors: # of players, distance of hole (min. 150), and grand prize value. All prices include grand prize coverage, bonus prize coverage, and contest signage. Above pricing based on all golfers being of amateur status and playing on 165 yard hole. Certain witness requirements may apply. Prices subject to change without prior notice. Try our Online Price Calculator. Please call us at 888-882-5440 if you experience any problems with this file. required to view this document. © Copyright Foresite Sports. All Rights Reserved.